This question came up recently from 7-year-old Baby Girl as she was watching the animated movie “Rise of the Guardians.” Alec Baldwin voices Santa Claus, who does speak with an accent, although I’m not sure it’s intended to be Italian. “Mom, listen to him!” she exclaimed, “Oh ya, he’s definitely Italian!” May I interject here how sweet I find it that she’s using a cartoon to verify her facts about Santa Claus. Certainly my family in Bari, Italy, in the heel of the country’s boot, would agree with her logic. Infatti (in fact), they might even say that Santa Claus is not only Italian, but more specifically, Baresi. 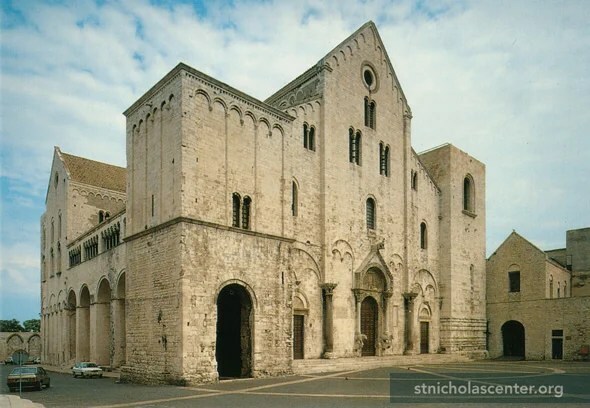 After all, the patron saint of Bari is San Nicola — Saint Nicholas — the man who inspired Santa Claus traditions around the world. Technically, he hailed from an area of the Roman Empire during the 4th century and became bishop of Myra, a town in what is now in modern Turkey. Several centuries after his death and following the conquering of the city by the Turks, sailors from Bari (and Venice) retrieved his bones from the cathedral at Myra, and brought them to ultimately rest in both cities. In life, Nicholas was known for his kindness and generosity, and for giving anonymous gifts at night. He became known as the patron saint of sailors, marriageable maidens, bankers, and even theives, but primarily he was known as the patron saint of children. His good works inspired many to join the Christian church. The most famous legend surrounding St. Nicholas involves a poor man in his diocese with three daughters of marriageable age. With their father unable to afford proper dowries or even provide for them at all, the girls were destined for a terrible fate. Nicholas, who had inherited wealth as a child when his parents died, on three separate occasions threw three purses filled with gold coins (one for each daughter) through an open window, or perhaps even down the chimney, of the house. Some accounts say the gold coins landed in socks which were left by the fire to dry, thus inspiring the tradition of Christmas stockings. While Italian children celebrate Babbo Natale, they also believe in La Befana, an old witch-looking woman who rides a broom and delivers presents on the night before Epiphany, (Epiphania) which is celebrated January 6. This marks the final day of the stagione natale, the Christmas season. There are different accounts for the woman who inspired this legend, but all agree that she lived at the time of Christ’s birth. One tale says she housed the three magi on their journey to visit the newborn king, but declined their invitation to join them on their journey, another says she denied them accommodations but had a change of heart. Either way has her leaving her home and searching for baby Jesus, riding her broomstick (she was known as an excellent housekeeper) and leaving candies (caramelle) for children along the way. Modern tradition has La Befana leaving good children toys and candy or fruit, while the naughty ones get coal, onions or garlic (carbone, cipolle, aglio). Families leave a small glass of wine and a plate with a few tidbits of food (typically local fare). Being a good housekeeper, La Befana may sweep the floor before she leaves the house, representing the sweeping away of the year’s problems. Buon Natale a Tutti! Merry Christmas to All! Tags: Babbo Natale, Christmas traditions, Italian traditions, La Befana, Santa Claus. Bookmark the permalink.